It feels great and it is such a huge honour to captain such a great club. It is my 12th year now and I came as a 25-year-old. I never thought I could be here for so long and achieve so much. Now, to lead the boys and look after the young boys, to guide them in some ways, it is a nice thing and a real pleasure. I came to this club as a footballer and I am now a huge fan. Flying under the radar a little bit but the less we see of him on the pitch the better. It's hardly surprising given his age, but taking the back end of last season into account, as well as this pre season, he looks finished at this level. An underwhelming pre-season. Looked off the pace much of the time. Man the dude is 36. Once he's fully match fit and sharp he'll give us some solid performances. Iirc in the past few seasons he's always been slow to pick up form, he'll be fine and will be important for us this season. He always starts slow but lets be sensible and add Dendoncker now, and for once sensibly phase out a fantastic player for us without ruining his legacy. No matter what game we are playing and what competition we are playing in, jose must not start Carrick and Fellini together. They are pathetic together. I don't want to see them together. He'll play a part, but it should be a small, spare part now. He's had a few exceptional seasons over his 11 years at United, but overall I think the sudden elevation of his reputation in the past few years has been a tad hyperbolic. Could really see the difference between him and Matic, but that's not surprising given the age. Let's use Carrick in the slow European games where he will get a bit more time on the ball, but his lack of legs/energy to stop counters is going to be a real problem. We can already tell he will get very limited premier league game time. Not sure if Mourinho trust him to play in the Champions League either. He should definitely play vs Burton Albion though, maybe give us a masterclass like against Northampton last season. He could be a very important player in english cup games, but that's about it. I miss the days when he was an undisputed starter. It's weird to have a captain not even make the squad sometimes. He should be limited only to FA cup and League cup games tbh. He's a great presence in the dressing room with his experience but we don't need him on the field anymore. League Cup and FA Cup won't be priorities this season. Particularly with how hard the league is and the CL added on to it. Carrick should be a cup player only, along with a few other players. Hard to believe it's not Scholes. What a man. Remember when he was criticized for passing only sideways? Does he actually ever pass sideways? You cnuts don't deserve a passing masterclass like that, if you're not going to appreciate it. Too easy for him. Just a class act. When he retires from United, he should take a year at a lesser league to just educate them about proper football. He's class! Was expecting a masterclass like last season against Northampton Town and am very happy with this. People who want to see him sold or retire are absolutely crazy. I hope he stays until 2019. There was a season where less than 30% of his passes were forwards if I remember correctly. Yeah, it's not very clear what I meant in my comment. He was rightly criticized for passing sideways too much, at one point, but now he barely does. His first motion when receiving the ball is always looking up the pitch and tracking the forwards movement. Should make him a coach next season imo. Very composed. Having him an extra year is great. For games like this, 2 man midfield will work for him. 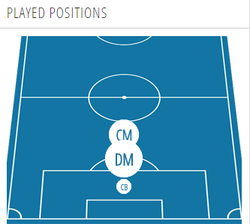 When injuries occur, having him in a 3 man midfield with runners around him will work. his passing and vision is fantastic. makes it looks so easy, always seems to have time on the ball. what a fantastic player he has been for united. It was around the time he had Cleverley for partner and Rooney, Berbatov and Giggs ahead of him. Played the game with slippers and a pipe! He was superb last night. After the McGregor Floyd fight Connor said it was Floyds composure that amazed him. 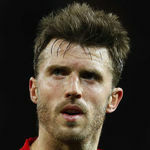 Watching Carrick last night his composure really stood out. People were going at him and he would never rush the pass, he just held his nerve until the very last 2nd. That pass in to Lingard for the Rashford goal and then the pass to Martial for the Lingard game. He always deferred to the better creative midfielder when played next to one. If Scholes were playing alongside him yesterday he'd have gone right back to the safe passes and giving the ball to his better partner. Makes sense in a way. Similarly we saw more passing range and playmaking from Matic against Everton as Pogba was out. The man is class in every sense. I'll miss him immensely. Really nice performance. He's been unlucky not to get any minutes so far, with a performance like that I wouldn't be surprised to see him behind Matic and Herrera against Southampton. That pass he made in the build-up of Lingard's goal was perfection. Nobody ventured in this thread during and for some time after the match, except me. I thought that's a shame, since his passing was more than worthy of praise. Any idea what his injury is? How has he managed to get himself injured. Builds the centre mid injury list up. 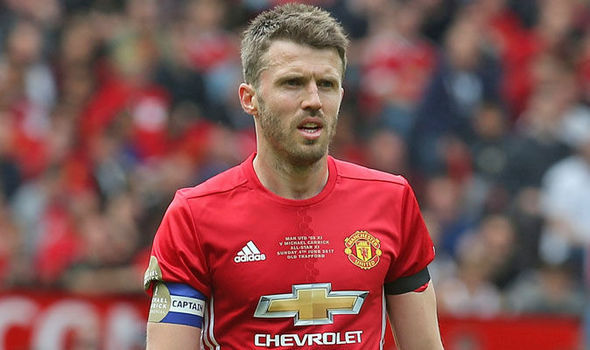 This is weird, reminds me of when Rooney was being left out of matchdays squads last season with undisclosed injuries..
MICHAEL CARRICK has been sidelined since feeling dizzy after his last match nearly SIX weeks ago. This month will probably be the only time we desperately needed him with both Pogba and Fellaini out. By the time Carrick is fit, all our first choice midfielders will also be back. Maybe we'll use him once in a while to rest Matic. Rumours are emerging that Aston Villa West Brom and Leicester are all planning to make offers for him in January but that he is unwilling to end his United career. I'm sure he is frustrated, but there's no way Mourinho hasn't talked to him about his role, he must know he won't play in the champions league or in the big PL games. I am one of the few people in this forum who actually wants him to be first choice in the midfield and play most of the matches, but I can acknowledge the more his career here goes on the more his age becomes a problem. I just think last season he was good and we saw nothing this season really to claim he is past an acceptable standard of performance. Past his prime yeah, sure, but just how much has he slowed down ? Rumours that he is done and might retire or play out his days at lower league clubs , talk of west brom and newcastle too, with benitez wanting a xabi alonso type midfielder. He has had a splendid career with us and i hope whatever his sendoff is, we recognize how important he has been for us. These are just rumours though, maybe they are due to his age and his illness that has not been defined.